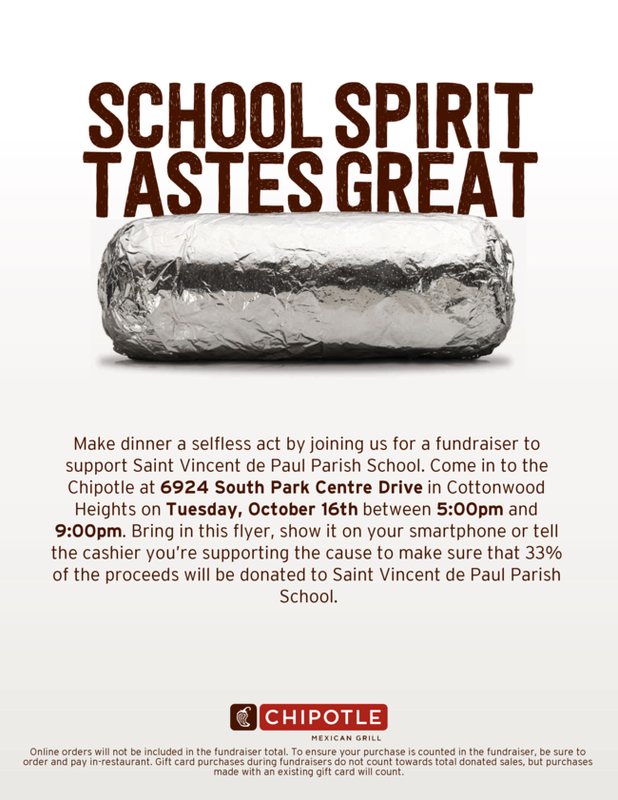 Don’t forget tonight, October 16th, is our fundraiser at Chipotle from 5:00 to 9:00 p.m.! See below for all the details. The Student Council will be having a Mass Collection on Thursday, October 18th. The money collected will be for Art with Heart, a benefit for Shriners Hospital. Shriners Hospital exists for one purpose: to provide quality care to children with orthopedic disabilities, spinal cord injuries and burns. All this is done at Shriners Hospital at absolutely no cost to families of these children. Over 4,000 children, each year, from the Western United States, come to the hospital to receive treatment. They help children better their lives and we are very excited to help accomplish this important goal. Please note that Friday, October 19th is fall break; there are no classes. This includes Extended Day. We will have early dismissal (12:30 PM) on Thursday, October 18th. This Friday, October 19th is the last day to sign up for CYO basketball. Please click here to sign up. Fees for 3rd – 8th grade are $100.00 and 2nd grade and High School are $75. This includes a new uniform. You may drop off the school fees to the school office. If you would like to pay with a credit card there is an additional 2.5% fee. We will send you the basketball schedule when it becomes available to us. Be a student/parishioner of a school/church that doesn’t have a team for your age group. If you would like to be a head coach or assistant coach, please contact Brody Candilora at brody@current-promos.com. Please contact the office with any questions. Please note that we will be collecting Box Tops on Monday, October 22nd not on October 19th. We will be emailing out 1st quarter reports cards on Tuesday, October 23rd. Please contact the school office if you have any questions. Join us on Saturday, November 3rd from 9 a.m. – 12 p.m. at the Carmelite Monastery (5714 S Holladay Boulevard, SLC). We will be serving our community by raking leaves and helping with other grounds cleanup. Please bring rakes, leaf blowers, and leaf bags if you have them. Many hands make light work! The Carmelites are very grateful for your service. Please email JoAnna (joanna.pedroza@gmail.com) with any questions and to let us know if you are planning to attend. Next Tuesday, October 23rd is Spirit Day. The theme for Spirit Day is black and white. Show us your school spirit and dress in black and white. 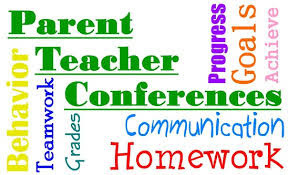 Parent-Teacher Conferences will be Thursday, October 25th and Friday, October 26th, except for Pre-K 4 who will start their Parent-Teacher Conferences on Wednesday. We are using Volunteer Spot to sign up for the conferences. Please click your child’s classroom link below to sign up. If you would like to meet with any of the specialized teachers (Middle School Math, Spanish, Music, Computer, P.E. ), please email them directly to set up a time. For any questions, please contact the school office at office@stvincents-school.org. In the school library on Wednesday, October 24th from 3:30 to 4:30 p.m., on Thursday, October 25th from 8:30 a.m. to 8:30 p.m., & on Friday, October 26th from 8:30 a.m. to 5:00 p.m. Questions? Contact Anna Zanarini azanarini@stvincents-school.org or 801-527-2070. Click here to volunteer for the Book Fair Sign Ups. Mrs. Lambert and I want our carnival to be lots of fun for the kids! (Anybody who knows me well knows that I absolutely love Halloween!) However, this is a family event and we do not want the younger children to be scared by our decorations or by costumes that other children wear. So, no weapons (real or fake) are allowed at the carnival. Children may wear masks and makeup, but they may not be too scary, be inappropriate for a Catholic event, or have blood (a small amount may be acceptable if cleared through us). What is too scary or inappropriate? Clearly, that is an opinion question, and the final determination of whether or not a costume/makeup is appropriate rests with Mrs. Lambert and me. There is no possible way for us to delineate every acceptable costume or type of makeup. So, if you are not sure if your child’s costume follows these rules, please call us and/or send us a picture. Thank you for your help in keeping the carnival fun for everyone! 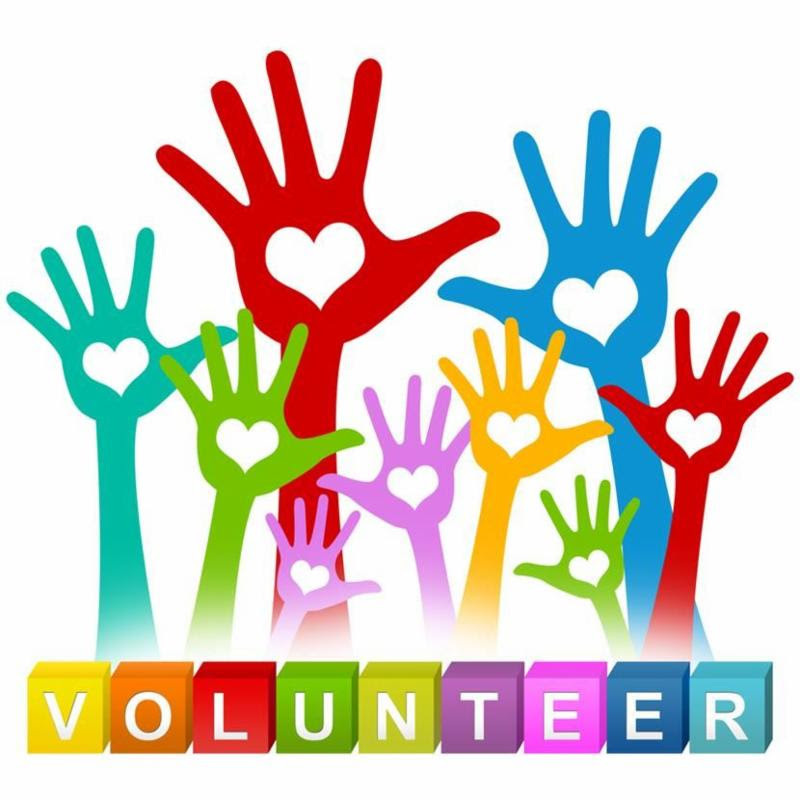 HSA is looking for volunteers to help with the Halloween Carnival. Please click on the link below to sign up. This is a great way to get you required PIP hours. Save the Date! Friday, November 16th at 6:30 p.m. in the Benvegnu Center. More details coming soon. Attached is an announcement for a youth speak on dating, relationships, and chastity that is happening at Blessed Sacrament Church on Wednesday, October 24. We are starting to work on our annual report and would like to include alumni news updates. If you are an alumna or alumnus, or know of someone who is, please send in any updates to Therese Clay at tclay@stvincents-school.org by Friday, October 19th. Accomplishments and changes in your life are of interest to us. Thank you! Sign up and follow us so you stay informed and see photos and posts about events and activities at our school. Please join!